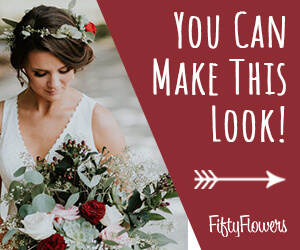 A guys boutonniere is more interesting with unique greenery. 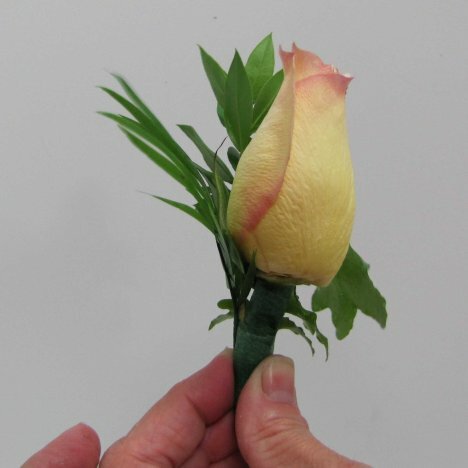 Leafshine dries to a pleasing glossy finish that looks beautiful in all arrangements, corsages and boutonniere work. 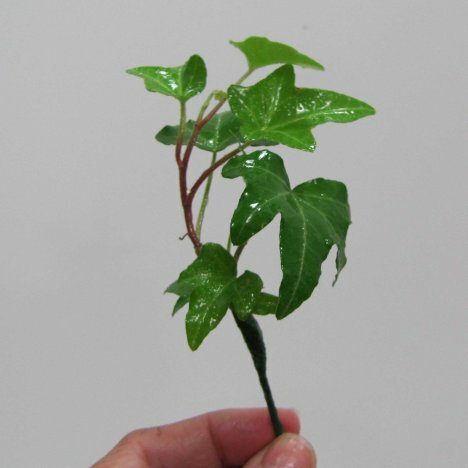 When making boutonnieres with fresh ivy, try to take advantage of the natural curve and flow of this lovely greenery. 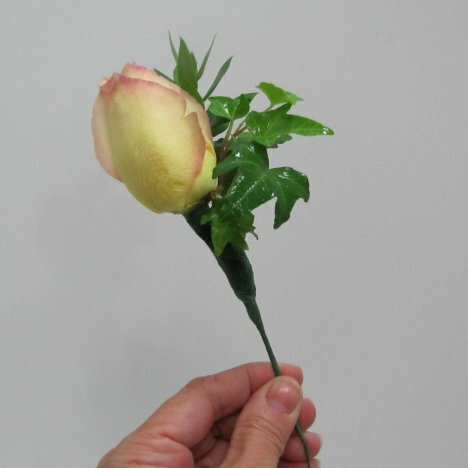 Tuck the ivy under the flower head and nestle it close to the base of the flower. See how I let the ivy curve naturally around the rose head? 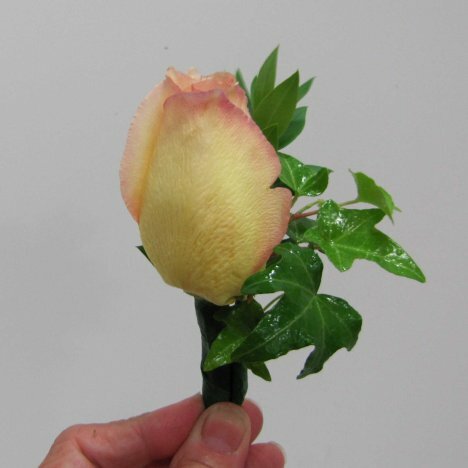 Learn to allow the grace of each fresh stem dictate how the design comes together. 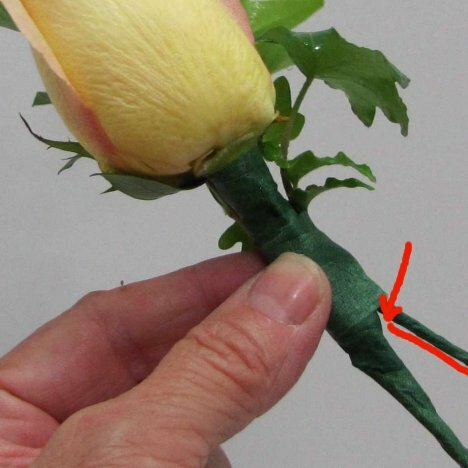 Tape snugly with florist tape, stretching it slightly so it adheres to itself down the stem. Earlier in the tutorial I commented that I like to keep the bulkiness of the stem down to a minimum. 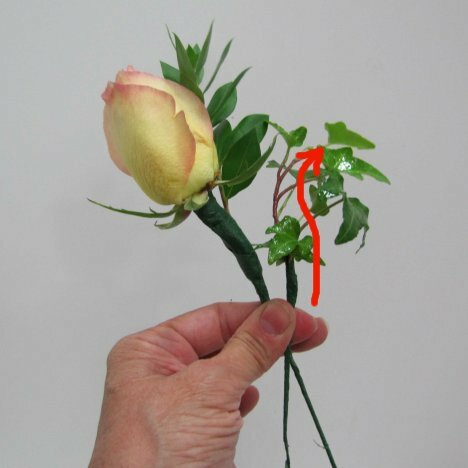 Once the ivy is secure, gently pull the excess wire away from the main corsage stem and snip it off with wire cutters. 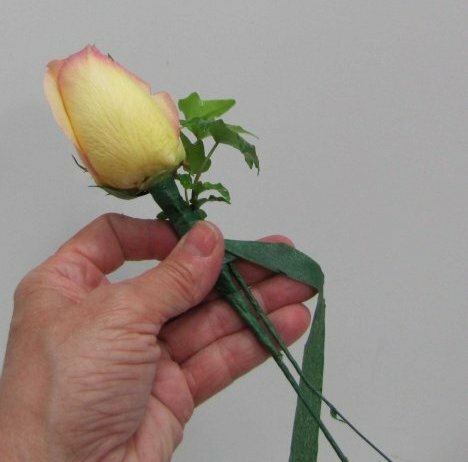 The longest stem tapers down to a narrow wire that will be easy to curl up or ribbon wrap later without a great thick stem to deal with. 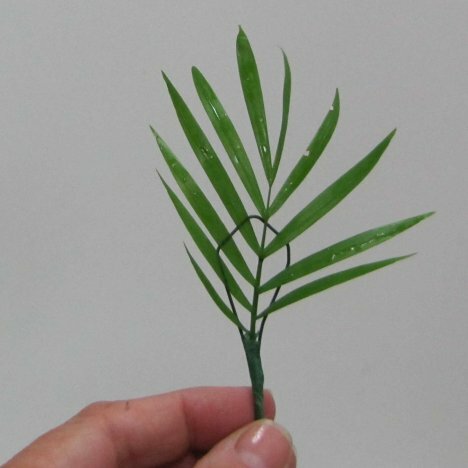 I like to incorporate a bit of miniature palm when making boutonnieres. You can snip them directly off a potted plant. 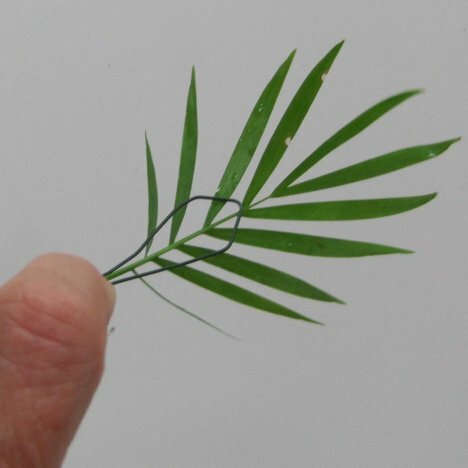 You need a short piece of 24 gauge wire and a small leaf from the plant. 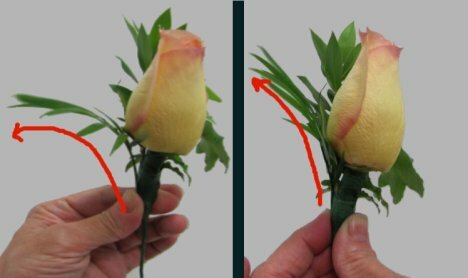 You could tape it directly the boutonniere, but the exaggerated curve can widen the look of the lapel flower and seem like a forest of greens. 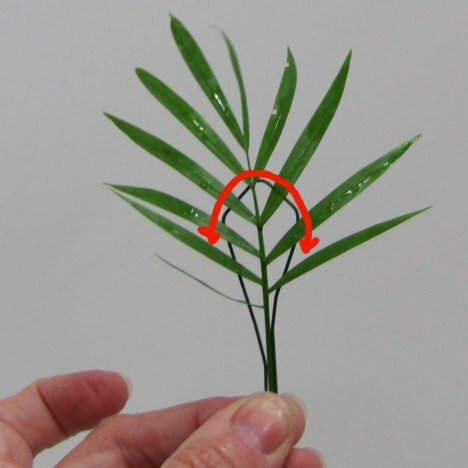 Taking a green florist wire, bend it into a wide hairpin curve that loops behind the palm branch, giving it support. Here's a back view the the wire. 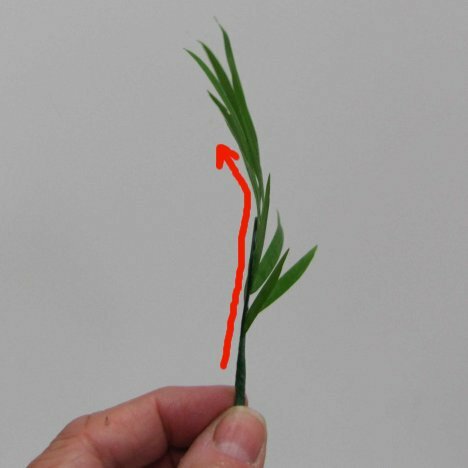 This helps take out the bend of the leaf and straightens it up a bit. It's hard to see in the photo, but I've actually looped the wire over the center branch so that it's hooked into the leaf and then taped it off at the bottom with florist tape. 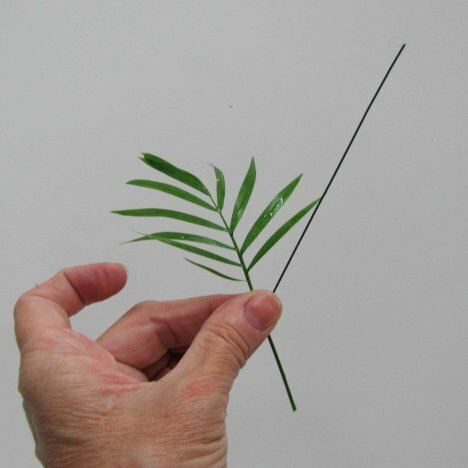 Now you can see the palm has straightened quite a bit, with a flair of a curve just at the top. Nestle the palm frond next to the rose head, opposite of the ivy leaf. 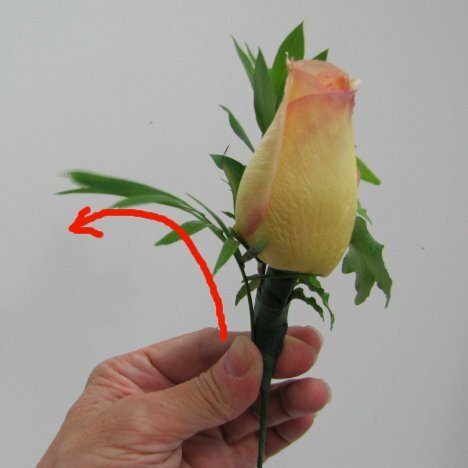 The lateral view shows that all the greens are clustered close to the rose head, creating a pleasing shape rather than an exaggerated curve had the greens not been wired. 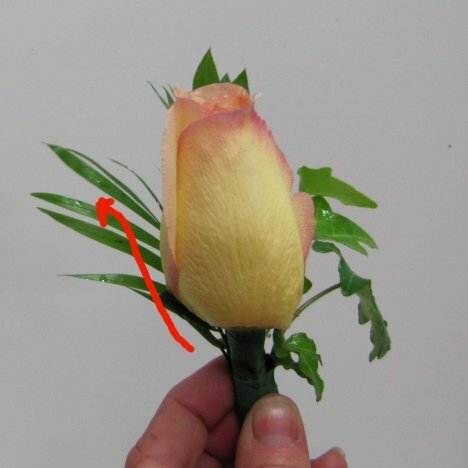 You can see the difference between what the frond looked like before and after wiring when placed close to the rose head.